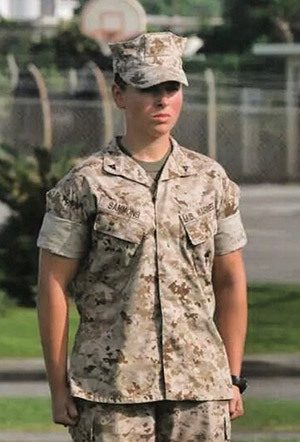 The feeling of pride had faded since Briana Sammons ‘18 returned from her service as Corporal in the United States Marine Corps, but as the notes sprang from the guitar and her words flowed from the mouth of a professional songwriter, the sense of pride came back to her in full force. 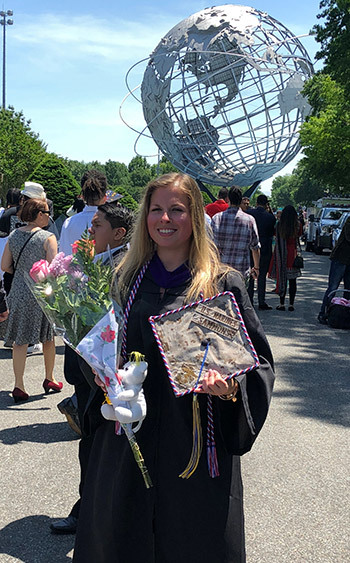 “I thought of my grandfather who was a Marine and was the reason why I joined, and how proud he would be of all of my accomplishments if he was still alive,” said Sammons, who graduated from John Jay College of Criminal Justice in May. She previously served in Japan, worked on a Joint Special Operations Task Force in the Philippines, then finished her last year of service in San Diego. Sammons is one of a dozen John Jay veterans who worked this fall with award-winning songwriters from Nashville and New York as part of Operation Song, an organization that pairs professional songwriters with veterans as a way to work through the post-active duty stress and acclimating to civilian life. Bob Regan founded Operation Song in 2012 after spending time on several Armed Forces Entertainment tours. John Jay is home to more than 500 veterans, the largest number among all CUNY campuses, and has a vibrant and active Office of Military and Veteran Services led by former Navy Chaplain Richard Pusateri. “We see people start out reticent and within themselves and then, after a couple of hours with our songwriters, they open up and share things. It’s fun to see that light go on,” added Regan. Sammons’ song, “I’ll Never Be The Same Again,” tells the story of her transformation from a girl to a woman struggling in a macho environment. The refrain, ‘Semper Fi Fidelis is tattooed on my skin’ shows her pride in the work she did as a Marine. Learn about the Office of Military and Veteran Services.